I hugged my jacket tighter around my torso and squinted up towards the dark sky, the frigid wind howling in my ears. Eyes stinging from the cold, I scanned the heavens for any trace of the elusive Northern Lights. It remained an unrelenting mass of bulbous, charcoal clouds. With a loud sigh that pierced the still Icelandic night, I turned to enter the warm cocoon of my host’s kitchen. I was in Akureyri, a small, peaceful harbour town, a stone’s throw from the Arctic Circle, thousands of miles from the bustling, sweltering metropolis that I call home – Dhaka. After months of drifting across Europe, relishing in my latest adventures, I was beginning to miss the comforts of home, particularly, my mum’s prawn curry. With a steaming plate of rice. Preferably with a wedge of lime on the side. I could not have been further from the source. I looked around the kitchen, longingly eyeing the industrial stove-top, the glistening Global knives, the copper pots shimmering above the counter. Our host, a celebrated baker, had clearly kitted out his home to reflect his passion for food. In a stroke of inspiration, I rummaged around my decrepit backpack, pulling out a bundle of Ziploc bags, carefully bound by a large rubber band. They contained some of my most treasured possessions – a range of spices that form the base for Bengali dishes. Couchsurfing around Europe didn’t profess very many opportunities to stock up on them, so I simply carried some on me. Determined to share my favourite meal with my generous Icelandic host, I traded in my traditional korai (a Bengali wok) for a fancy copper pot and the usual chaotic, crush of people outside my window for a serene vista of distant fjords looming in the dark. At dinner that night, we sat around the table, our toes snug in our woollen socks, warmed by underfloor heating, discussing glacier hikes, the buttery prawns melting in our mouths as we scooped up the fiery curry and rice with our hands, and it was all too surreal. Oil: 2 – 3 tbsp. 1. Wash and de-vein the prawns. 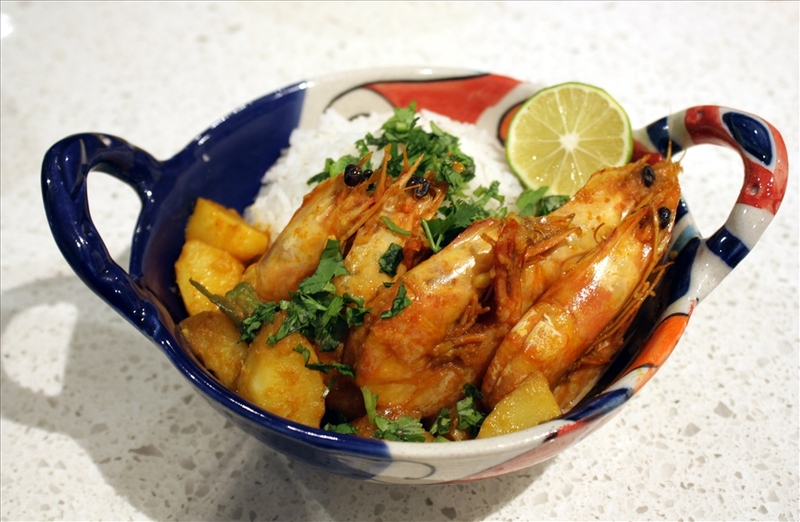 Marinate prawns with a pinch of turmeric and chilli powder and set aside for 15 minutes. Note: Leaving the head, shells and tail on adds an added depth of flavour to the dish, but this is optional. 2. Heat 2 tbsp. oil in a pan and in a medium flame, fry the diced potatoes with a pinch of salt till golden. Drain and set aside. 3. 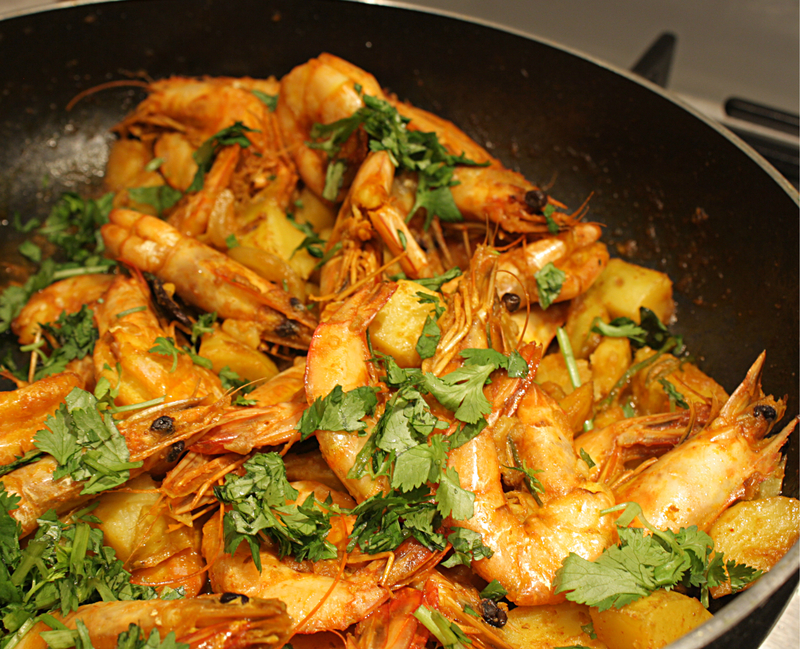 In the same pan, fry the prawns on both sides until they just as they begin to turn pink and curl slightly. Drain and set aside. This is to prevent the prawns from over-cooking, as that will make them tough and rubbery. 4. Top up the oil if necessary. Add the bay leaf, cardamom, cinnamon and cloves. Fry for 2 – 3 minutes over a medium flame. You’ll notice a distinct aroma of the frying spices at this stage. 5. Add the onion puree and ginger paste and fry till it turns golden. 6. Add the turmeric and chilli powder to the spices. Fry for about 2 minutes, stirring intermittently. If the gravy begins to dry out, add 2 – 3 tbsp. of water. 7. After about a minute, add the potatoes, sugar and salt to taste. . Cover and let it cook for 2 – 3 minutes. 8. Add tomato puree and stir. 9. 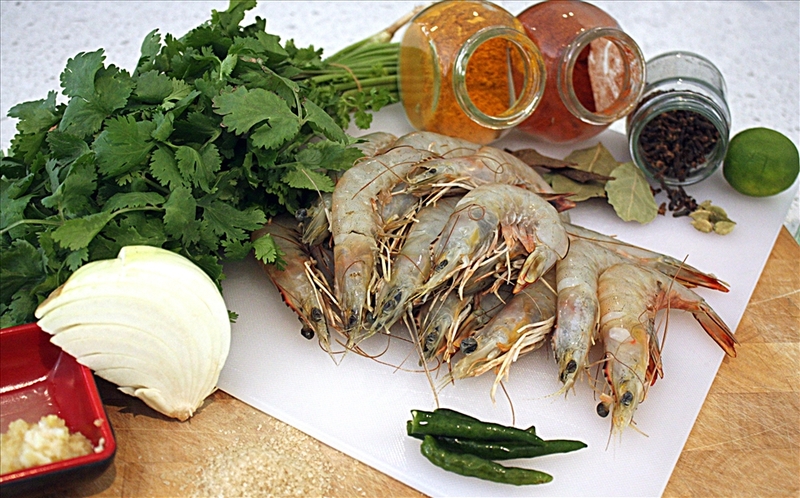 Add the prawns and green chilli to the sauce, carefully coating them with the gravy. 10. Mix in half a cup of water, cover and let it simmer over a medium flame for about 5 minutes. 11. Sprinkle freshly chopped coriander over the prawns. 12. Serve with steamed white rice.